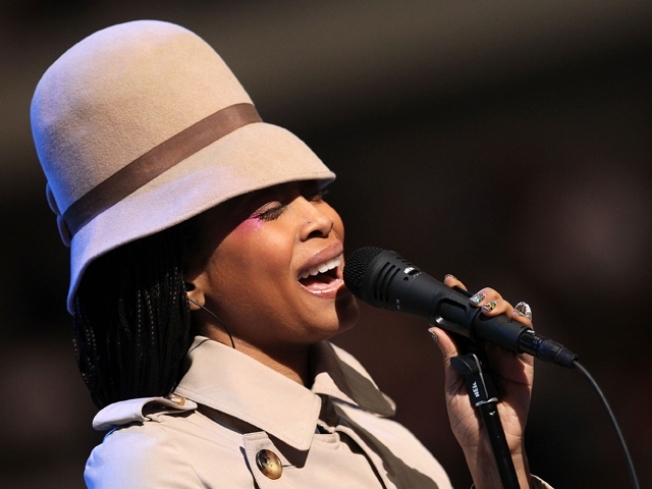 Erykah Badu has taken off her clothes – and started a controversy. The R&B singer's new video for "Window Seat," the lead single from her highly-anticipated new album "New Amerykah Part Two: Return of the Ankh" (released Tuesday), features the neo-soul star walking through her home town of Dallas' Dealey Plaza and stripping down piece by piece until she appears completely naked. The video ends with the singer being shot and killed in the Plaza – at the exact same location of President John F. Kennedy's 1963 assassination. "They who play it safe, are quick to assassinate what they do not understand. They move in packs, ingesting more and more fear with every act of hate on one another. They feel most comfortable in groups – less guilt to swallow," she says in a monologue that closes the video as passers-by ignore her "dead" body. "They are us. This is what we have become." "I don't understand how someone who lives here, who is a resident of this city, could do such a thing," Dallas civic volunteer Lindalyn Adams told the Dallas Morning News. John Crawford, president of the Downtown Dallas organization, told the paper, "It's in poor taste and poor judgment, in my opinion." Erykah defended herself to the paper, calling the video, "a protest… about liberating yourself." "I tied it in a way that compared the [JFK] assassination to the character assassination one would go through after showing his or her self completely," she said. "That's exactly the action I wanted to display." As if its content wasn't provocative enough, the single-take video was reportedly shot without a permit in front of unprepared pedestrians– leaving Erykah open to charges of indecent exposure. However, according to the paper, the singer "almost certainly won't be" charged. The paper further reported that no witness has yet complained of the filming. "Window Seat" isn't entirely controversial though. Starting April 1, it's being featured all month as Delta Airlines in-flight boarding music! And Rolling Stone says of the new album, "'New Amerykah Part Two' revives Badu's romantic side, and at its best it places her on a sun-splashed day in 1972…" Entertainment Weekly gives the album an "A-". PLAY IT NOW: Dish Of Salt: Gerard Butler Gets Naked For 'How To Train Your Dragon'? !